Ps 119:153 RESH “Consider my affliction, and deliver me, for I don’t forget your law. 154 Plead my cause, and redeem me! Revive me according to your promise. 155 Salvation is far from the wicked, for they don’t seek your statutes. 156 Great are your tender mercies, Yahweh. Revive me according to your ordinances. 157 Many are my persecutors and my adversaries. I haven’t swerved from your testimonies. 158 I look at the faithless with loathing, because they don’t observe your word. 159 Consider how I love your precepts. Revive me, Yahweh, according to your hesed/loyal covenantal love.160 All of your words are truth/faithful. Every one of your righteous ordinances endures forever." Observations: 119:153-155 Afflicted by evildoers, the psalmist calls to God for help, reminding Him that he meets the requirements for being rescued (he keeps God's law). Those who don't seek and do aren't candidates for salvation, therefore it is far from them. 119:156-158 He presses his plea on the basis of God's mercy, and his own loyalty to God, which expresses itself in not swerving from God's way, and loathing those who do. 119:159-160 He concludes his case with an invitation for God to consider his love of God's word, and Yahweh's hesed to those who do so. His final hope and trust is in the enduring truth of God's righteous words. Application: Those who wish to be rescued and redeemed need to be in a position for God's hesed (covenantal loyalty) to apply. 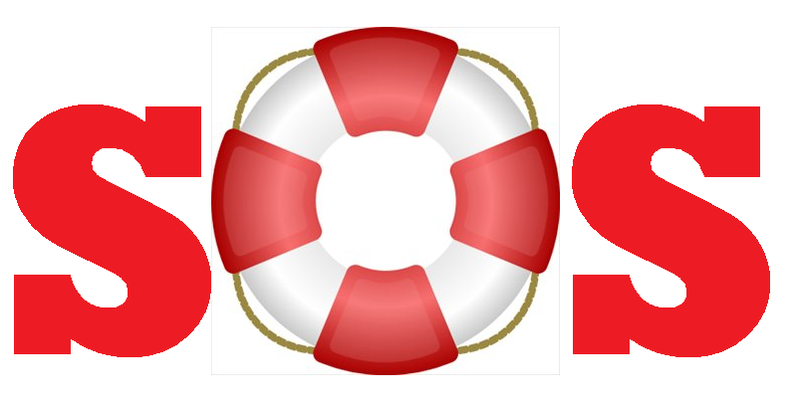 Prayer: God, You are faithful to all Your promises and rescue those who faithfully seek to obey You; may I always be in a position for You to rescue me. Thanks. Amen. Observations: 29:10-11 If you are following God and His ways, you will attract your share of detractors. The worst are those who are violent to the point of bloodshed. In doing Satan's will they want to eliminate people of integrity who serve as a reminder of the uprightness God enables and desires. Fortunately God specializes in protecting His servants (cf the prophets). 29:11 Fools were never trained to discipline their emotions, and as a result, when they encounter something they don't like, they have no self-control. That's why their mouth is their ruin (Proverbs 18:7). The wise person, who has an objective that is higher than expressing how they feel, can control his/her responses. Application: Choosing the right objectives (like pleasing and glorifying God), helps control our anger. Prayer: God, may I not get angry of the fallout from fools, but instead live with confidence in Your protection and Your good plans for me. Amen. John 4-6 This section contains Jesus' second sign, as He heals a nobleman's son, with a word at the end of chapter 4. 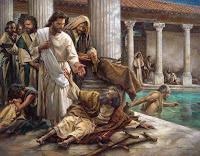 He heals a man at the Pool of Bethesda, in chapter 5 as well. John records two key miracles, the only one mentioned in the other gospels is in chapter 6. If one adds the resurrection of Jesus and the miraculous catch of fish (in the last chapter) to the standard “Seven Signs” designed to lead people to life, a superior structure emerges: nine miracles, with walking on water as the chiastic center. There is awkward language in the account as the “disciples willingly receive Him” into the boat. This matches the chiastic center of the prologue (1:12-13). The receptivity to Jesus is highlighted in these chapters. Those who accept His words get life; those who reject don't. It's virtually impossible to trace John's thought through these chapters without understanding the chiastic structure, so I incorporated it into the text. If you're used to reading the text in your own Bible, you won't see what you're missing. 4:1 Therefore when the Lord knew that the Pharisees had heard that Jesus was making and baptizing more disciples than John 2 (although Jesus himself didn’t baptize, but his disciples), 3 he left Judea, and departed into Galilee. 4 He needed to pass through Samaria. 5 So he came to a city of Samaria, called Sychar, near the parcel of ground that Jacob gave to his son, Joseph. 6 Jacob’s well was there. Jesus therefore, being tired from his journey, sat down by the well. It was about the sixth hour. 7 A woman of Samaria came to draw water. Jesus said to her, "Give me a drink." 8 For his disciples had gone away into the city to buy food. 9 The Samaritan woman therefore said to him, "How is it that you, being a Jew, ask for a drink from me, a Samaritan woman?" (For Jews have no dealings with Samaritans.) 10 Jesus answered her, "If you knew the gift of God, and who it is who says to you, ‘Give me a drink,’ you would have asked him, and he would have given you living water." 11 The woman said to him, "Sir, you have nothing to draw with, and the well is deep. From where then have you that living water? 12 Are you greater than our father, Jacob, who gave us the well, and drank of it himself, as did his children, and his livestock?" 13 Jesus answered her, "Everyone who drinks of this water will thirst again, 14 but whoever drinks of the water that I will give him will never thirst again; but the water that I will give him will become in him a well of water springing up to eternal life." 15 The woman said to him, "Sir, give me this water, so that I don’t get thirsty, neither come all the way here to draw." 16 Jesus said to her, "Go, call your husband, and come here." 17 The woman answered, "I have no husband." Jesus said to her, "You said well, ‘I have no husband,’ 18 for you have had five husbands; and he whom you now have is not your husband. This you have said truly." 19 The woman said to him, "Sir, I perceive that you are a prophet. 20 Our fathers worshiped in this mountain, and you Jews say that in Jerusalem is the place where people ought to worship." 21 Jesus said to her, "Woman, believe me, the hour comes, when neither in this mountain, nor in Jerusalem, will you worship the Father. 22 You worship that which you don’t know. We worship that which we know; for salvation is from the Jews. 23 But the hour comes, and now is, when the true worshipers will worship the Father in spirit and truth, for the Father seeks such to be his worshipers. 24 God is spirit, and those who worship him must worship in spirit and truth." 25 The woman said to him, "I know that Messiah comes," (he who is called Christ). "When he has come, he will declare to us all things." 26 Jesus said to her, "I am he, the one who speaks to you." 27 At this, his disciples came. They marveled that he was speaking with a woman; yet no one said, "What are you looking for?" or, "Why do you speak with her?" 28 So the woman left her water pot, and went away into the city, and said to the people, 29 "Come, see a man who told me everything that I did. Can this be the Christ?" 30 They went out of the city, and were coming to him. 31 In the meanwhile, the disciples urged him, saying, "Rabbi, eat." 32 But he said to them, "I have food to eat that you don’t know about." 33 The disciples therefore said one to another, "Has anyone brought him something to eat?" 34 Jesus said to them, "My food is to do the will of him who sent me, and to accomplish his work. 35 Don’t you say, ‘There are yet four months until the harvest?’ Behold, I tell you, lift up your eyes, and look at the fields, that they are white for harvest already. 36 He who reaps receives wages, and gathers fruit to eternal life; that both he who sows and he who reaps may rejoice together. 37 For in this the saying is true, ‘One sows, and another reaps.’ 38 I sent you to reap that for which you haven’t labored. Others have labored, and you have entered into their labor." 39 From that city many of the Samaritans believed in him because of the word of the woman, who testified, "He told me everything that I did." 40 So when the Samaritans came to him, they begged him to stay with them. He stayed there two days. 41 Many more believed because of his word. 42 They said to the woman, "Now we believe, not because of your speaking; for we have heard for ourselves, and know that this is indeed the Christ, the Savior of the world." 43 After the two days he went out from there and went into Galilee. 44 For Jesus himself testified that a prophet has no honor in his own country. 45 So when he came into Galilee, the Galileans received him, having seen all the things that he did in Jerusalem at the feast, for they also went to the feast. 46 Jesus came therefore again to Cana of Galilee, where he made the water into wine. 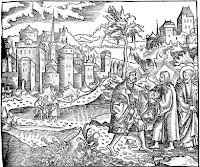 There was a certain nobleman whose son was sick at Capernaum. 47 When he heard that Jesus had come out of Judea into Galilee, he went to him, and begged him that he would come down and heal his son, for he was at the point of death. 48 Jesus therefore said to him, "Unless you see signs and wonders, you will in no way believe." 49 The nobleman said to him, "Sir, come down before my child dies." 50 Jesus said to him, "Go your way. Your son lives." The man believed the word that Jesus spoke to him, and he went his way. 51 As he was now going down, his servants met him and reported, saying "Your child lives!" 52 So he inquired of them the hour when he began to get better. They said therefore to him, "Yesterday at the seventh hour, the fever left him." 53 So the father knew that it was at that hour in which Jesus said to him, "Your son lives." He believed, as did his whole house. 54 This is again the second sign that Jesus did, having come out of Judea into Galilee. Observations: 4:1-26 Jesus evangelizes the woman at the water cooler. Please see the seventh of the 7PASSAGES in the sidebar “Your Relationship with Unbelievers” for comments on the passage. Truthbase.net also has a sermon on the topic, as well as ones on Reasonable Evangelism. 4:27-42 In the aftermath of Jesus' discussion, the woman shares her experience, testifying to Jesus, and some believe on the basis of her word, and more believe on the basis of “come and see.” They had a more positive response than did the Jews. Hearing Jesus' words convinced them. Worship, must have a cognitive component (truth) to be Biblical. Remember, worship is a response to revelation (See Genesis 22). Samaria was the capital of pagan worship in Israel (for which they went into captivity in Assyria, and never returned). They might have had the emotional part, but not the truth part. As Jesus said, they didn't know what they were worshiping. The Jews did, because they had the OT. The Samaritans now believe and “know” (verse 42). 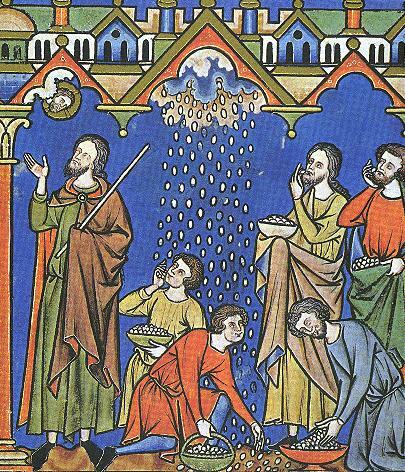 Notice that the disciples had to buy food (but maybe not wine). Jesus had the “food” of doing the Father's will, that energized Him. The disciples missed the spiritual aspect of His comment, and took it on the physical plane (a common theme in John). The Samaritans confess that Jesus, the Messiah, was the Savior of the world, not just Judah. John had also said He was the Lamb of God that took away the sins of the world. This is totally in accord with the Messianic prophecies. The Messiah would rescue and redeem Israel, but then, through them, all the world would be blessed. 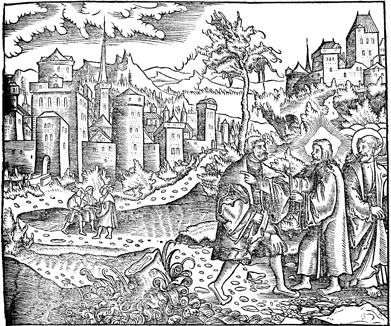 The miracles have differences and similarities; the rejection in Jerusalem contrasts with the reception in Samaria; the Interview with Nicodemus and that with the woman at the well reveal both theology and needs; the center section (3:16-36) contains Jesus' discourse on eternal life, and John's witness to it. Application: It is belief in Jesus' word that gives life, not miracles or what someone else says. Prayer: God, thanks that You are interested in people and their needs; help me have similar values as I seek to share Your words with them. Amen. 5:1 After these things, there was a feast of the Jews, and Jesus went up to Jerusalem. 2 Now in Jerusalem by the sheep gate, there is a pool, which is called in Hebrew, "Bethesda," having five porches. 3 In these lay a great multitude of those who were sick, blind, lame, or paralyzed, waiting for the moving of the water; 4 for an angel went down at certain times into the pool, and stirred up the water. Whoever stepped in first after the stirring of the water was made whole of whatever disease he had. 5 A certain man was there, who had been sick for thirty-eight years. 6 When Jesus saw him lying there, and knew that he had been sick for a long time, he asked him, "Do you want to be made well?" 7 The sick man answered him, "Sir, I have no one to put me into the pool when the water is stirred up, but while I’m coming, another steps down before me." 8 Jesus said to him, "Arise, take up your mat, and walk." 9 Immediately, the man was made well, and took up his mat and walked. Now it was the Sabbath on that day. 10 So the Jews said to him who was cured, "It is the Sabbath. It is not lawful for you to carry the mat." 11 He answered them, "He who made me well, the same said to me, ’Take up your mat, and walk.’" 12 Then they asked him, "Who is the man who said to you, ’Take up your mat, and walk’?" 13 But he who was healed didn’t know who it was, for Jesus had withdrawn, a crowd being in the place. 14 Afterward Jesus found him in the temple, and said to him, "Behold, you are made well. Sin no more, so that nothing worse happens to you." 15 The man went away, and told the Jews that it was Jesus who had made him well. 16 For this cause the Jews persecuted Jesus, and sought to kill him, because he did these things on the Sabbath. 17 But Jesus answered them, "My Father is still working, so I am working, too." 18 For this cause therefore the Jews sought all the more to kill him, because he not only broke the Sabbath, but also called God his own Father, making himself equal with God. A1 19 Jesus therefore answered them, "Most certainly, I tell you, the Son can do nothing of himself, but what he sees the Father doing. For whatever things he does, these the Son also does likewise. 20 For the Father has affection for the Son, and shows him all things that he himself does. He will show him greater works than these, that you may marvel. 21 For as the Father raises the dead and gives them life, even so the Son also gives life to whom he desires. A3 23 that all may honor the Son, even as they honor the Father. He who doesn’t honor the Son doesn’t honor the Father who sent him. B 24 "Most truly I tell you, he who hears my word, and believes him who sent me, has eternal life, and doesn’t come into judgment, but has passed out of death into life. C 25 Most truly, I tell you, the hour comes, and now is, when the dead will hear the Son of God’s voice; and those who hear will live. d' 26b even so he gave to the Son also to have life in himself. b' 29 and will come out; those who have done good, to the resurrection of life; and those who have done evil, to the resurrection of judgment. a1' 30a I can of myself do nothing. a3' 30c because I don’t seek my own will, but the will of my Father who sent me. A 31 "If I testify about myself, my witness is not valid. B 32 It is another who testifies about me. I know that the testimony which he testifies about me is true. C 33 You have sent to John, and he has testified to the truth. 34a But the testimony which I receive is not from man. D However, I say these things that you may be saved. b' 36b for the works which the Father gave me to accomplish, the very works that I do, testify about me, that the Father has sent me. a' 37 The Father himself, who sent me, has testified about me. You have neither heard his voice at any time, nor seen his form. A 38 You don’t have his word living in you; because you don’t believe him whom he sent. B 39 "You search the Scriptures, because you think that in them you have eternal life; and these are they which testify about me. 40 Yet you will not come to me, that you may have life. C 41 I don’t receive glory from men. 42 But I know you, that you don’t have God’s love in yourselves. D 43a I have come in my Father’s name, and you don’t receive me. d' 43b If another comes in his own name, you will receive him. c' 44 How can you believe, who receive glory from one another, and you don’t seek the glory that comes from the only God? b' 45 "Don’t think that I will accuse you to the Father. There is one who accuses you, even Moses, on whom you have set your hope. 46 For if you believed Moses, you would believe me; for he wrote about me. a' 47 But if you don’t believe his writings, how will you believe my words?" 5:19-30 Note the “unusual” chiastic structure where the “A” has subpoints which match those of the “a'.” The center emphasizes the central idea, that Jesus has the ability to give life, because He has it “in Himself,” a gift of the father. That's why those who hear His voice will “live,” as shown in the miracle which opened the chapter. There are some fascinating insights about the communication patterns between the Father and Jesus, which aren't that applicable to us, and would better fit in a full-blown commentary. John 5:24 is a great verse to memorize, and useful for sharing the good news with others, delineating the difference between hear and believe. See The Bridge to Life on Truthbase.net, and learn to share it with others. The benefits listed in 5:24, cancel out the effects of Romans 3:23; 6:23; and Hebrews 9:27. "Believing" (B v24) gets you out of the realm of the spiritually dead into the realm of the spiritually living, as a present possession. Once there, ”doing” good (b' v29) gets you rewarded with the abundant life/dominion, while “doing” evil gets you judgment, at the resurrection in the future. Without understanding the structural correspondence between “B” and “b',” one can't understand how to reconcile the “believe” and “do” of these verses. There are multiple judgments (2Cor 5:10) so one must always ask what judgment does a believer in in Jesus' words not come into. If you believe (as in act on) all of them, then you face no negative judgment, but a positive judgment for reward. If you only believe some, you only get some of the benefits God wants to give you, and probably some things you wouldn't want if you were thinking clearly. 5:31-37 The chiastic center again gives the emphasis. God sends Jesus, and authenticates His words as true, so people can believe and be saved. Prayer: God, thanks for giving me life in Christ; please guide me in doing what pleases You, seeking the glory that comes from You, the only God. Amen. 6:1 After these things, Jesus went away to the other side of the sea of Galilee, which is also called the Sea of Tiberias. 2 A great multitude followed him, because they saw his signs which he did on those who were sick. 3 Jesus went up into the mountain, and he sat there with his disciples. 4 Now the Passover, the feast of the Jews, was at hand. 5 Jesus therefore lifting up his eyes, and seeing that a great multitude was coming to him, said to Philip, "Where are we to buy bread, that these may eat?" 6 This he said to test him, for he himself knew what he would do. 7 Philip answered him, "Two hundred denarii worth of bread is not sufficient for them, that everyone of them may receive a little." 8 One of his disciples, Andrew, Simon Peter’s brother, said to him, 9 "There is a boy here who has five barley loaves and two fish, but what are these among so many?" 10 Jesus said, "Have the people sit down." Now there was much grass in that place. So the men sat down, in number about five thousand. 11 Jesus took the loaves; and having given thanks, he distributed to the disciples, and the disciples to those who were sitting down; likewise also of the fish as much as they desired. 12 When they were filled, he said to his disciples, "Gather up the broken pieces which are left over, that nothing be lost." 13 So they gathered them up, and filled twelve baskets with broken pieces from the five barley loaves, which were left over by those who had eaten. 14 When therefore the people saw the sign which Jesus did, they said, "This is truly the prophet who comes into the world." 16 When evening came, his disciples went down to the sea, 17 and they entered into the boat, and were going over the sea to Capernaum. It was now dark, and Jesus had not come to them. 18 The sea was tossed by a great wind blowing. 19 When therefore they had rowed about twenty-five or thirty stadia, they saw Jesus walking on the sea, and drawing near to the boat; and they were afraid. 20 But he said to them, "It is I. Don’t be afraid." 21 They were willing therefore to receive him into the boat. Immediately the boat was at the land where they were going. 22 On the next day, the multitude that stood on the other side of the sea saw that there was no other boat there, except the one in which his disciples had embarked, and that Jesus hadn’t entered with his disciples into the boat, but his disciples had gone away alone. 23 However boats from Tiberias came near to the place where they ate the bread after the Lord had given thanks. A(Capernaum Teaching) 24 When the multitude therefore saw that Jesus wasn’t there, nor his disciples, they themselves got into the boats, and came to Capernaum, seeking Jesus. 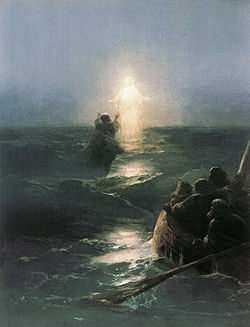 25 When they found him on the other side of the sea, they asked him, "Rabbi, when did you come here?" 26 Jesus answered them, "Most certainly I tell you, you seek me, not because you saw signs, but because you ate of the loaves, and were filled. B(Eternal Food Q&A) 27 Don’t work for the food which perishes, but for the food which remains/abides to eternal life, which the Son of Man will give to you. For God the Father has sealed him." 28 They said therefore to him, "What must we do, that we may work the works of God?" 29 Jesus answered them, "This is the work of God, that you believe in him whom he has sent." 30 They said therefore to him, "What then do you do for a sign, that we may see, and believe you? What work do you do? 31 Our fathers ate the manna in the wilderness. As it is written, ‘He gave them bread out of heaven to eat.’"
C(True Bread gives life) 32 Jesus therefore said to them, "Most certainly, I tell you, it wasn’t Moses who gave you the bread out of heaven, but my Father gives you the true bread out of heaven. 33 For the bread of God is that which comes down out of heaven, and gives life to the world." 34 They said therefore to him, "Lord, always give us this bread." D(I am) 35 Jesus said to them, "I am the bread of life. He who comes to me will not be hungry, and he who believes in me will never be thirsty. E(No Believe) 6 But I told you that you have seen me, and yet you don’t believe. F(Come to Me) 37 All those whom the Father gives me will come to me. He who comes to me I will in no way throw out. 38 For I have come down from heaven, not to do my own will, but the will of him who sent me. that of all he has given to me I should lose nothing, but should raise him up at the last day. because he said, "I am the bread which came down out of heaven." 42 They said, "Isn’t this Jesus, the son of Joseph, whose father and mother we know? How then does he say, ’I have come down out of heaven?’"
43 Therefore Jesus answered them, "Don’t murmur among yourselves. g'(Raised last day) 44 No one can come to me unless the Father who sent me draws him, and I will raise him up in the last day. f'(Come to Me) 45 It is written in the prophets, ‘They will all be taught by God.’ Therefore everyone who hears from the Father, and has learned, comes to me. 46 Not that anyone has seen the Father, except he who is from God. He has seen the Father. e'(Believe) 47 Most certainly, I tell you, he who believes in me has eternal life. d'(I am) 48 I am the bread of life. 49 Your fathers ate the manna in the wilderness, and they died. 50 This is the bread which comes down out of heaven, that anyone may eat of it and not die. c'(Living Bread gives life) 51 I am the living bread which came down out of heaven. If anyone eats of this bread, he will live forever. Yes, the bread which I will give for the life of the world is my flesh." b'(Eternal Food Q&A) 52 The Jews therefore contended with one another, saying, "How can this man give us his flesh to eat?" 53 Jesus therefore said to them, "Most certainly I tell you, unless you eat the flesh of the Son of Man and drink his blood, you don’t have life in yourselves. 54 He who eats my flesh and drinks my blood has eternal life, and I will raise him up at the last day. 55 For my flesh is food indeed, and my blood is drink indeed. 56 He who eats my flesh and drinks my blood lives in me, and I in him. 57 As the living Father sent me, and I live because of the Father; so he who feeds on me, he will also live because of me. 58 This is the bread which came down out of heaven—not as our fathers ate the manna, and died. He who eats this bread will live forever." a'(Capernaum Teaching) 59 He said these things in the synagogue, as he taught in Capernaum. 60 Therefore many of his disciples, when they heard this, said, "This is a hard saying! Who can listen to it?" 61 But Jesus knowing in himself that his disciples murmured at this, said to them, "Does this cause you to stumble? 62 Then what if you would see the Son of Man ascending to where he was before? 63 It is the spirit who gives life. The flesh profits nothing. The words that I speak to you are spirit, and are life. 64 But there are some of you who don’t believe." For Jesus knew from the beginning who they were who didn’t believe, and who it was who would betray him. 65 He said, "For this cause have I said to you that no one can come to me, unless it is given to him by my Father." 66 At this, many of his disciples went back, and walked no more with him. 67 Jesus said therefore to the twelve, "You don’t also want to go away, do you?" 68 Simon Peter answered him, "Lord, to whom would we go? You have the words of eternal life. 69 We have come to believe and know that you are the Christ, the Son of the living God." 70 Jesus answered them, "Didn’t I choose you, the twelve, and one of you is a devil?" 71 Now he spoke of Judas, the son of Simon Iscariot, for it was he who would betray him, being one of the twelve. 6:16-21 By transcending the material reality (walking above the water) Jesus comes to the disciples, who “receive Him” into the boat. This matches the “receiving” emphasis of the chiastic center of the prologue (1:12-13). Immediately, they are brought safely to shore, saved from the sea in which they were perishing (cf accounts in synoptics which emphasize that, and of which John was aware). 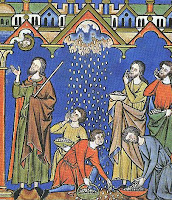 The “water” miracle stands in the middle of that at Cana (water into wine) and the miraculous catch of fish in chapter 21. Some see this as an illusion to the Spirit of God hovering over the waters in Genesis 1, symbolic of the new creation (they might be right). 6:24-59 Note the correspondence and emphasis in the above chiastic layout in the text. The Incarnation is the center of the discourse. Jesus comes from heaven, and offers eternal life through His words; those who accept/receive His words get life, and will be raised up on the last day. It is belief that gets life, the eating metaphor is just that, a metaphor. Jesus will elaborate upon abiding in the word in the Upper Room Discourse (John 15). This is not at all about cannibalism, communion, or the Eucharist. John doesn't even mention the Lord's Supper in the gospel (who knew?). You'd think that if eating His body in a Eucharistic sense was so important, John would have told his readers something about “this is my body.” To “eat” or “drink” is to incorporate something into one's life (like Jesus' words). Look at verse 63 where Jesus clears up the metaphor, in a manner consistent with what He has been saying about the importance of believing His words: 63 It is the spirit who gives life. The flesh profits nothing. The words that I speak to you are spirit, and are life. 6:60-71 Another misunderstood concept is that of the Father drawing or teaching people. He does that for all, but only some respond (we've seen that a lot so far). He gives all a witness, because you can't get to the Father without the revelation about the Son. God loves the whole world (Jn 3:16) and sent Jesus, the Lamb of God as the Savior of the whole world, so all could believe. The Father's authenticating work from John the Baptist to multiple miracles is to draw people to eternal life. People misunderstand and stumble over truth. Many of the disciples turned back and no longer walked with Him. One of the most tense moments in Jesus' ministry occurred when He asked the disciples if they too, would walk away. Peter has his most shining moment when he confesses in 6:68-69 that there is nowhere else to go. The reason the moment is tense, is because belief and following aren't automatic, but are acts of the will. That's why Judas could choose to betray, and others could choose to walk away. Application: If you believe and know that Jesus has the words of eternal life, then you know there are no other paths to follow but His. Do you believe this? Prayer: Jesus, thanks for making Your truth knowable, and accessible, and preserving it so I can learn it and believe it, and follow it; don't let me ever be deceived into thinking that You are not my life. Amen. God in a nutshell: God draws people to the words of Jesus so they can hear and believe. Build-a-Jesus: Jesus offers life to those who believe what He has revealed. He is the Savior of the world, and is the source of life eternal life to those who believe Him. Us in a nutshell: The work God wants us to do is believe what Jesus has revealed. That would include obeying what He said. Some will, and some won't . Those who believe pass from death to life. Those who obey, and do good, get resurrected to abundant life. Those who don't, face judgment. 4 He needed to pass through Samaria. 5 So he came to a city of Samaria, called Sychar, near the parcel of ground that Jacob gave to his son, Joseph. 6 Jacob’s well was there. Jesus therefore, being tired from his journey, sat down by the well. It was about the sixth hour. 7 A woman of Samaria came to draw water. Jesus said to her, "Give me a drink." 8 For his disciples had gone away into the city to buy food. 9 The Samaritan woman therefore said to him, "How is it that you, being a Jew, ask for a drink from me, a Samaritan woman?" (For Jews have no dealings with Samaritans.) 10 Jesus answered her, "If you knew the gift of God, and who it is who says to you, ‘Give me a drink,’ you would have asked him, and he would have given you living water." 11 The woman said to him, "Sir, you have nothing to draw with, and the well is deep. From where then have you that living water? 12 Are you greater than our father, Jacob, who gave us the well, and drank of it himself, as did his children, and his livestock?" 13 Jesus answered her, "Everyone who drinks of this water will thirst again, 14 but whoever drinks of the water that I will give him will never thirst again; but the water that I will give him will become in him a well of water springing up to eternal life." 15 The woman said to him, "Sir, give me this water, so that I don’t get thirsty, neither come all the way here to draw." 16 Jesus said to her, "Go, call your husband, and come here." 17 The woman answered, "I have no husband." Jesus said to her, "You said well, ‘I have no husband,’ 18 for you have had five husbands; and he whom you now have is not your husband. This you have said truly." 19 The woman said to him, "Sir, I perceive that you are a prophet. 20 Our fathers worshipped in this mountain, and you Jews say that in Jerusalem is the place where people ought to worship." 21 Jesus said to her, "Woman, believe me, the hour comes, when neither in this mountain, nor in Jerusalem, will you worship the Father. 22 You worship that which you don’t know. We worship that which we know; for salvation is from the Jews. 23 But the hour comes, and now is, when the true worshippers will worship the Father in spirit and truth, for the Father seeks such to be his worshippers. 24 God is spirit, and those who worship him must worship in spirit and truth." 25 The woman said to him, "I know that Messiah comes," (he who is called Christ). "When he has come, he will declare to us all things." 26 Jesus said to her, "I am he, the one who speaks to you." 27 At this, his disciples came. They marvelled that he was speaking with a woman; yet no one said, "What are you looking for?" or, "Why do you speak with her?" 28 So the woman left her water pot, and went away into the city, and said to the people, 29 "Come, see a man who told me everything that I did. Can this be the Christ?" 30 They went out of the city, and were coming to him. 31 In the meanwhile, the disciples urged him, saying, "Rabbi, eat." 32 But he said to them, "I have food to eat that you don’t know about." 33 The disciples therefore said one to another, "Has anyone brought him something to eat?" 34 Jesus said to them, "My food is to do the will of him who sent me, and to accomplish his work. 35 Don’t you say, ‘There are yet four months until the harvest?’ Behold, I tell you, lift up your eyes, and look at the fields, that they are white for harvest already. 36 He who reaps receives wages, and gathers fruit to eternal life; that both he who sows and he who reaps may rejoice together. 37 For in this the saying is true, ‘One sows, and another reaps.’ 38 I sent you to reap that for which you haven’t laboured. Others have laboured, and you have entered into their labour." 39 From that city many of the Samaritans believed in him because of the word of the woman, who testified, "He told me everything that I did." 40 So when the Samaritans came to him, they begged him to stay with them. He stayed there two days. 41 Many more believed because of his word. 42 They said to the woman, "Now we believe, not because of your speaking; for we have heard for ourselves, and know that this is indeed the Christ, the Saviour of the world." 43 After the two days he went out from there and went into Galilee. 44 For Jesus himself testified that a prophet has no honour in his own country. 45 So when he came into Galilee, the Galileans received him, having seen all the things that he did in Jerusalem at the feast, for they also went to the feast. 46 Jesus came therefore again to Cana of Galilee, where he made the water into wine. 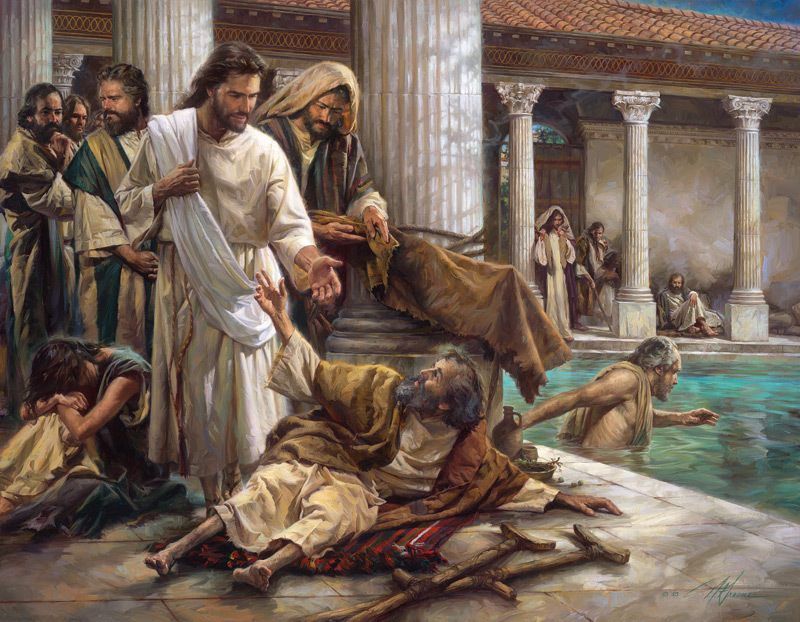 There was a certain nobleman whose son was sick at Capernaum. 47 When he heard that Jesus had come out of Judea into Galilee, he went to him, and begged him that he would come down and heal his son, for he was at the point of death. 48 Jesus therefore said to him, "Unless you see signs and wonders, you will in no way believe." 49 The nobleman said to him, "Sir, come down before my child dies." 50 Jesus said to him, "Go your way. Your son lives." The man believed the word that Jesus spoke to him, and he went his way. 51 As he was now going down, his servants met him and reported, saying "Your child lives!" 52 So he inquired of them the hour when he began to get better. They said therefore to him, "Yesterday at the seventh hour, the fever left him." 53 So the father knew that it was at that hour in which Jesus said to him, "Your son lives." He believed, as did his whole house. 54 This is again the second sign that Jesus did, having come out of Judea into Galilee. 5:1 After these things, there was a feast of the Jews, and Jesus went up to Jerusalem. 2 Now in Jerusalem by the sheep gate, there is a pool, which is called in Hebrew, "Bethesda," having five porches. 3 In these lay a great multitude of those who were sick, blind, lame, or paralysed, waiting for the moving of the water; 4 for an angel went down at certain times into the pool, and stirred up the water. Whoever stepped in first after the stirring of the water was made whole of whatever disease he had. 5 A certain man was there, who had been sick for thirty-eight years. 6 When Jesus saw him lying there, and knew that he had been sick for a long time, he asked him, "Do you want to be made well?" 7 The sick man answered him, "Sir, I have no one to put me into the pool when the water is stirred up, but while I’m coming, another steps down before me." 8 Jesus said to him, "Arise, take up your mat, and walk." 9 Immediately, the man was made well, and took up his mat and walked. Now it was the Sabbath on that day. 10 So the Jews said to him who was cured, "It is the Sabbath. It is not lawful for you to carry the mat." 11 He answered them, "He who made me well, the same said to me, ’Take up your mat, and walk.’" 12 Then they asked him, "Who is the man who said to you, ’Take up your mat, and walk’?" 13 But he who was healed didn’t know who it was, for Jesus had withdrawn, a crowd being in the place. 14 Afterward Jesus found him in the temple, and said to him, "Behold, you are made well. Sin no more, so that nothing worse happens to you." 15 The man went away, and told the Jews that it was Jesus who had made him well. 16 For this cause the Jews persecuted Jesus, and sought to kill him, because he did these things on the Sabbath. 17 But Jesus answered them, "My Father is still working, so I am working, too." 18 For this cause therefore the Jews sought all the more to kill him, because he not only broke the Sabbath, but also called God his own Father, making himself equal with God. 19 Jesus therefore answered them, "Most certainly, I tell you, the Son can do nothing of himself, but what he sees the Father doing. For whatever things he does, these the Son also does likewise. 20 For the Father has affection for the Son, and shows him all things that he himself does. He will show him greater works than these, that you may marvel. 21 For as the Father raises the dead and gives them life, even so the Son also gives life to whom he desires. 22 For the Father judges no one, but he has given all judgment to the Son, 23 that all may honour the Son, even as they honour the Father. He who doesn’t honour the Son doesn’t honour the Father who sent him. 24 "Most certainly I tell you, he who hears my word, and believes him who sent me, has eternal life, and doesn’t come into judgment, but has passed out of death into life. 25 Most certainly, I tell you, the hour comes, and now is, when the dead will hear the Son of God’s voice; and those who hear will live. 26 For as the Father has life in himself, even so he gave to the Son also to have life in himself. 27 He also gave him authority to execute judgment, because he is a son of man. 28 Don’t marvel at this, for the hour comes, in which all that are in the tombs will hear his voice, 29 and will come out; those who have done good, to the resurrection of life; and those who have done evil, to the resurrection of judgment. 30 I can of myself do nothing. As I hear, I judge, and my judgment is righteous; because I don’t seek my own will, but the will of my Father who sent me. 31 "If I testify about myself, my witness is not valid. 32 It is another who testifies about me. I know that the testimony which he testifies about me is true. 33 You have sent to John, and he has testified to the truth. 34 But the testimony which I receive is not from man. However, I say these things that you may be saved. 35 He was the burning and shining lamp, and you were willing to rejoice for a while in his light. 36 But the testimony which I have is greater than that of John, for the works which the Father gave me to accomplish, the very works that I do, testify about me, that the Father has sent me. 37 The Father himself, who sent me, has testified about me. You have neither heard his voice at any time, nor seen his form. 38 You don’t have his word living in you; because you don’t believe him whom he sent. 39 "You search the Scriptures, because you think that in them you have eternal life; and these are they which testify about me. 40 Yet you will not come to me, that you may have life. 41 I don’t receive glory from men. 42 But I know you, that you don’t have God’s love in yourselves. 43 I have come in my Father’s name, and you don’t receive me. If another comes in his own name, you will receive him. 44 How can you believe, who receive glory from one another, and you don’t seek the glory that comes from the only God? 45 "Don’t think that I will accuse you to the Father. There is one who accuses you, even Moses, on whom you have set your hope. 46 For if you believed Moses, you would believe me; for he wrote about me. 47 But if you don’t believe his writings, how will you believe my words?" 15 Jesus therefore, perceiving that they were about to come and take him by force, to make him king, withdrew again to the mountain by himself. 16 When evening came, his disciples went down to the sea, 17 and they entered into the boat, and were going over the sea to Capernaum. It was now dark, and Jesus had not come to them. 18 The sea was tossed by a great wind blowing. 19 When therefore they had rowed about twenty-five or thirty stadia, they saw Jesus walking on the sea, and drawing near to the boat; and they were afraid. 20 But he said to them, "It is I. Don’t be afraid." 21 They were willing therefore to receive him into the boat. Immediately the boat was at the land where they were going. 22 On the next day, the multitude that stood on the other side of the sea saw that there was no other boat there, except the one in which his disciples had embarked, and that Jesus hadn’t entered with his disciples into the boat, but his disciples had gone away alone. 23 However boats from Tiberias came near to the place where they ate the bread after the Lord had given thanks. 24 When the multitude therefore saw that Jesus wasn’t there, nor his disciples, they themselves got into the boats, and came to Capernaum, seeking Jesus. 25 When they found him on the other side of the sea, they asked him, "Rabbi, when did you come here?" 26 Jesus answered them, "Most certainly I tell you, you seek me, not because you saw signs, but because you ate of the loaves, and were filled. 27 Don’t work for the food which perishes, but for the food which remains to eternal life, which the Son of Man will give to you. For God the Father has sealed him." 28 They said therefore to him, "What must we do, that we may work the works of God?" 29 Jesus answered them, "This is the work of God, that you believe in him whom he has sent." 30 They said therefore to him, "What then do you do for a sign, that we may see, and believe you? What work do you do? 31 Our fathers ate the manna in the wilderness. As it is written, ‘He gave them bread out of heaven to eat.’" 32 Jesus therefore said to them, "Most certainly, I tell you, it wasn’t Moses who gave you the bread out of heaven, but my Father gives you the true bread out of heaven. 33 For the bread of God is that which comes down out of heaven, and gives life to the world." 34 They said therefore to him, "Lord, always give us this bread." 35 Jesus said to them, "I am the bread of life. He who comes to me will not be hungry, and he who believes in me will never be thirsty. 36 But I told you that you have seen me, and yet you don’t believe. 37 All those whom the Father gives me will come to me. He who comes to me I will in no way throw out. 38 For I have come down from heaven, not to do my own will, but the will of him who sent me. 39 This is the will of my Father who sent me, that of all he has given to me I should lose nothing, but should raise him up at the last day. 40 This is the will of the one who sent me, that everyone who sees the Son, and believes in him, should have eternal life; and I will raise him up at the last day." 41 The Jews therefore murmured concerning him, because he said, "I am the bread which came down out of heaven." 42 They said, "Isn’t this Jesus, the son of Joseph, whose father and mother we know? How then does he say, ’I have come down out of heaven?’" 43 Therefore Jesus answered them, "Don’t murmur among yourselves. 44 No one can come to me unless the Father who sent me draws him, and I will raise him up in the last day. 45 It is written in the prophets, ‘They will all be taught by God.’ Therefore everyone who hears from the Father, and has learned, comes to me. 46 Not that anyone has seen the Father, except he who is from God. He has seen the Father. 47 Most certainly, I tell you, he who believes in me has eternal life. 48 I am the bread of life. 49 Your fathers ate the manna in the wilderness, and they died. 50 This is the bread which comes down out of heaven, that anyone may eat of it and not die. 51 I am the living bread which came down out of heaven. If anyone eats of this bread, he will live forever. Yes, the bread which I will give for the life of the world is my flesh." 52 The Jews therefore contended with one another, saying, "How can this man give us his flesh to eat?" 53 Jesus therefore said to them, "Most certainly I tell you, unless you eat the flesh of the Son of Man and drink his blood, you don’t have life in yourselves. 54 He who eats my flesh and drinks my blood has eternal life, and I will raise him up at the last day. 55 For my flesh is food indeed, and my blood is drink indeed. 56 He who eats my flesh and drinks my blood lives in me, and I in him. 57 As the living Father sent me, and I live because of the Father; so he who feeds on me, he will also live because of me. 58 This is the bread which came down out of heaven—not as our fathers ate the manna, and died. He who eats this bread will live forever." 59 He said these things in the synagogue, as he taught in Capernaum.